Take Route 44 west through Avon. Left at first stoplight (West Mountain Road). Flamig Farm is located four miles on the left. Take exit 39 follow Route 4 west. After two miles, look for the Wood 'n' Tap Restaurant on your right. Turn right just before the restaurant onto Brickyard road. Continue straight on Route 167. Cross intersection with Route 44. Left at first stop light after the intersection (West Mountain Road). Turn right on Route 309 (Farms Village Road) in Simsbury. Follow Route 309 into downtown West Simsbury. You'll see a firehouse on the left. Take next left onto West Mountain Road. 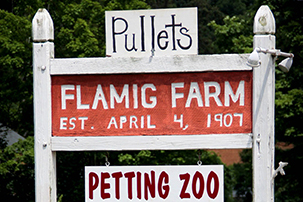 First right and you are at Flamig Farm. Follow Route 185 to Simsbury. At 2nd light, turn left on Stratton Brook. 2nd stop light, turn left on Route 309 (Farms Village Road). First left on West Mountain Road.